Sexually transmitted diseases (STD) are major health problems all over the world including India, although available data on the magnitude of STDs in India is of questionable quality. The annual incidence of STD in India as reported to the Central Bureau of Health Intelligence during 1989 was approximately 14 million. Community-based studies and other limited studies suggest that HIV rates are high in both rural and urban areas. A national STD control program has been in operation since the mid-1950s. The program is clinic based, however, and covers only 5% of all STD patients in the country, with the majority of patients attending private health care providers, the informal sector, or resorting to self medication. In acknowledgement of the need to strengthen the STD control program, especially in the context of the recently launched AIDS control program, efforts are being made to extend the existing program at the community level through existing private health care services in the country. A phased approach to implementing the STD Control Program in the 32 states and union territories has been adopted. This programmatic extension from the clinic to the community has become a necessity as the vast majority of patients are being treated without laboratory investigation by private practitioners. Efforts to control STDs should focus upon increasing the availability and acceptance of curative and preventive measures by individual patients and the community. Sustained support from national and international agencies will be needed in order for this new strategy to be successful. Total 240 cases of 2-12 years age group who had contact of tuberculosis indirectly or directly and had chronic illness were screened for tuberculosis. Out of 240 cases, 180 cases were diagnosed as tuberculosis. Special emphasis was given on Mantoux Test (M.T. ), though the battery of tests were done to diagnose tuberculosis. Out of 180 cases of Tuberculosis, M.T. was Positive in 97 cases (40.41%) and repeat M.T. was done after 3 weeks and was converted to Positive in 20 cases (8.33%). Thus only M.T. help in diagnosis of Tuberculosis in almost 50% of the cases. Physical parameters and pulmonary function tests (VC, FEV1, FEV1% and FEF25-75%) were collected in 112 urban industrial workers and 104 rural agricultural workers. These average values, values according to age and smoking habits were compared between urban and rural workers. Inspite of no differences in age, rural workers average height, weight, BSA is significantly lower than urban workers. A significant increase in VC value to the extent of 0.22 lit (7.1%), significantly lower FEV 1% value by 4.7% and reduce FEF25-75% value (4.7%) is demonstrated in rural than urban workers. Smoking is shown to produce airway obstruction in both urban and rural workers. A wide variation of PFT values between the present workers and other reported values in India is observed. This study indicates rural workers have better pulmonary capacity and less flow rates than their urban counterpart. 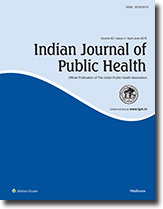 The present study was conducted on 2611 school children of a rural area of Meerut, with the objectives to find out the prevalence and distribution of endemic goitre and the socioeconomic variables associated with the distribution of the endemic goitre. Grading of goitre was done as per the criteria laid down by the WHO-1979 (1). The overall prevalence rate of endemic goitre was 50.1%, the prevalence was more among females (55.1%) as compared to males (47.2%). Maximum number of goitre cases were having grade Ia enlargement (46.9%) followed by grade Ib (34.1%), grade 2(15.0%) and grade 3 (4.0%). Prevalence increased with increase in age. Statistically significant differences were found in the prevalence of endemic goitre in relation to different religions and caste groups, different occupations of the parents/guardians of children and types of houses used for the purpose of living. Total of 4567 sera samples obtained from high risk groups viz. blood donors, patients attending skin/VD clinics have been examined for HIV-antibodies. None of them showed seropositivity. Since in Bihar, interaction with foreigners is not common as it is in the metropolitan cities of India, this may be one of the chief reasons for not finding any HIV-seropositive case so far. 7% of blood donors showed VDRL positive reaction. Both competitive ELISA and particulate-agglutination tests on 375 sera samples gave identical negative result. To obtain the base line data, a study conducted in district Patna, Bihar to note the susceptibility status of adult Culex quinquefasciatus against organochlorine, organophosphorous and synthetic pyrethroids. It was found that adult of Cx.quinquefasciatus developed double resistance to DDT and dieldrin but susceptible to O.P. compounds and pyrethroids. Cx.quinquefasciatus larvae are also found susceptible to O.P compounds like malathion, temophos, fenthion and fenitrothion. Information on births and deaths was collected in 11 randomly selected AWW areas of Barhaj Mahen ICDS project area in Eastern U.P. by an independent survey team in 1988-89. The findings revealed that the births and deaths were under-reported to the tune of 36.6 and 13.9 percent respectively, by AWWs. The different demographic indicators generated from the data were as follows, CBR and CDR were 30.3 and 7.1 per 1000 population. Neonatal mortality rate, IMR, and MMR were 58.3, 74.7 and 6.5 per 1000 live births. 0-6 yr mortality was 16.3 per 1000 children and constituted 37.5% of the total deaths. ARI, diarrhoea and fever were the major causes of mortality in 0-6 yr old children accounting for 25.9, 22.3 and 14.8% respectively. The findings indicated that there was underreporting in adult mortalities despite the independent investigation, and a reduction in infant and childhood mortality possibly due to the beneficial effect of ICDS services.